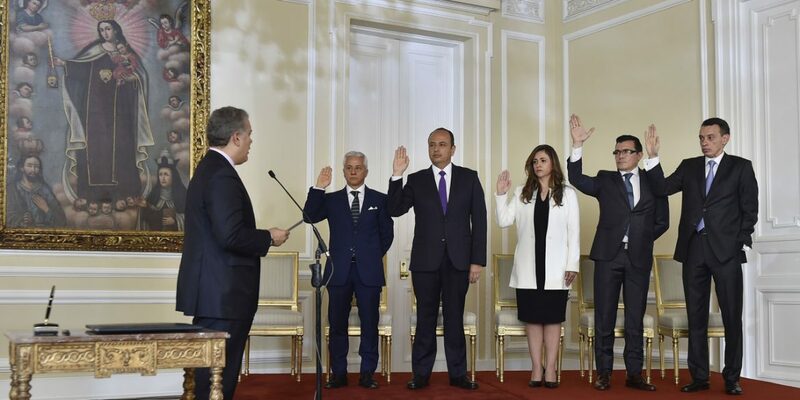 President Ivan Duque on Monday swore in five new members of the Supreme Court who will continue ongoing investigations against former President Alvaro Uribe and hundreds of other elected officials. The five new Supreme Court magistrates were will join four colleagues who were already in the top court’s Penal Chamber. In January, the court was expanded with an appeals chamber that would allow convicted politicians to appeal, and has taken the past nine months to fill the positions. Among the investigated politicians are the president’s political patron and his former debate chief, who are both accused of ties to death squads to advance their political careers. But they are not alone. According to local media, the Supreme Court has a backlog of some 400 criminal cases against congressmen, governors and other elected officials. Over the past decade, more than 60 lawmakers and seven governors have been sentenced to prison by the court, mainly because of their ties to illegal armed groups or corruption. Colombia’s justice system, including the Supreme Court, has been clogged for decades, primarily because of crimes committed in the chaos caused by the country’s armed conflict. When chief prosecutor Nestor Humberto Martinez took office in 2016, he warned that the judicial system was on the brink of collapse and that the country’s impunity rate had become virtually absolute. Uribe, for example, has been accused of ties to organized crime since the early 1980s, but wasn’t charged for any of his alleged crimes since February.